Just about one year ago this week, the first store at the Clark Commons opened. The grand opening of the Modell’s store, where members of the NY Giants were in attendance for the ribbon cutting and to do signings. Now it’s a year later and all the stores and restaurants are open. The anchor of the Commons is the Whole Foods, this store is absolutely beautiful and features the Clark Bar, a beer and burger bar. There are are at least seven restaurants to satisfy any appetite in the Commons. Some other stores are Michael’s, Dress Barn, Petco, 5 Below and Home Goods to name a few. There’s also a PNC Bank branch and a large LA Fitness Facility. This complex has added a lot of new jobs to Clark. 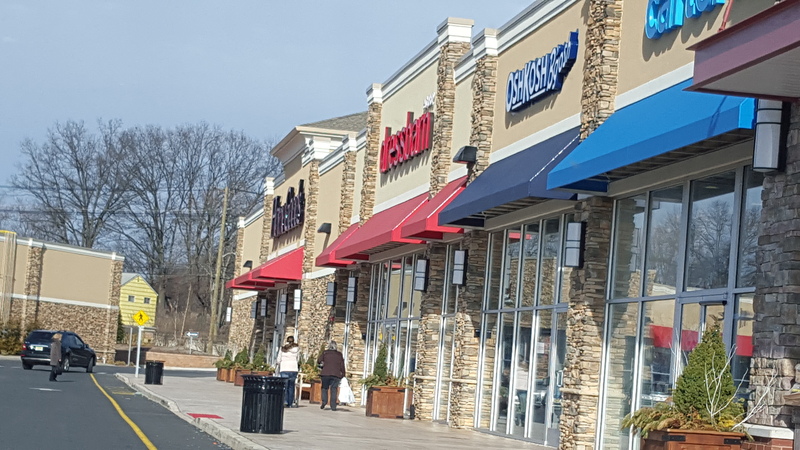 With such easy access from the Garden State Parkway the Clark Commons is becoming the place to be! Before you buy or sell a home in Clark, it’s important to first understand how current market conditions compare to past market conditions and what that means for the future. Here’s what you need to know for August, 2016. Inventory: There are currently 81 homes offered for sale in Clark. It is normal for summer inventory to be higher than winter inventory and this year is no exception. There were 15 homes sold in July. With increased sales in the summer, the inventory will drop down this autumn. The law of supply and demand predicts that this will result in increasing home prices in Clark. Prices: The average sold home in Clark in July was sold for $344,088. That’s a little low for Clark and it’s reasonable to predict that will correct itself with higher average sale prices next month. Days on Market: Sellers who want to sell their home quickly should work with their Realtor to ensure that the home is priced competitively, is in excellent showing condition, and is being marketed with an aggressive marketing campaign. 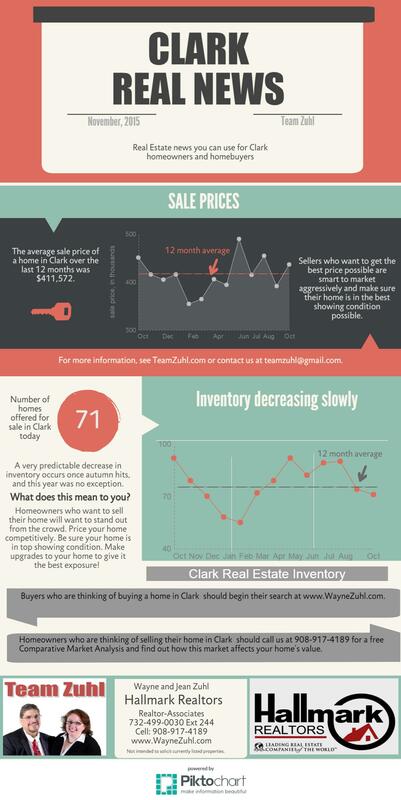 The average Days on Market for a sold home in Clark in July was 29 days. For more information on Clark and Clark Real Estate, please click here. Your Clark real estate market report is ready for you. What do these numbers mean and how will it affect you? Please view our Clark real estate market report here. Clark, NJ, is a township in southern Union County. New Jersey Monthly has ranked Clark as its 33rd best place to live in 2008 and 174th in 2013. The approximately 3000 school age children in Clark are served by Clark’s public school system which includes Frank K. Hehnly Elementary School, Valley Road Elementary School, Carl H. Kumpf Middle School, and Arthur L. Johnson High School. Clark is served by the Lehigh Valley Railroad and New Jersey Transit provides bus service to New York City. There were 14 homes sold in October of 2015 and there were 71 active listings, compared to a 12 month average of 76 listings. The average Clark home sold in October was sold for $436,179 compared to a 12 month average of $411,572. The average sold home was sold after 54 days in October, much slower than the summer peak of 31 days in July and much faster than the 75 days it took to sell a home in March of 2015. Clark, NJ is home to 15,000 people and was incorporated as a township in 1864. Clark was named for Abraham Clark, a signer of the Declaration of Independence. Before you buy or sell a home in Clark, your first step is to understand how the real estate market is performing. Here’s what you need to know this summer. There are currently 54 single family homes offered for sale in Clark which is lower than we normally see in the summer. A lower inventory might boost prices. Twelve homes were sold in June, just under the 12 month average of 14 homes and lower than we normally see in June. The average home that sold in Clark in June was sold for $489,458, almost 20% higher than the twelve month average in Clark. Sellers who want to get top dollar for their home will want to be sure that their marketing is on point and that their home is appropriately priced. Buyers who are looking for a bargain in Clark will want to do their research. When you find the home you want to buy, be sure that your offer is competitive because there are many multiple offer situations this summer. Homes sell quickly in Clark. In June, the average home sold after 75 days, a bit longer than the 12 month average of 61 days. Home sellers who are interested in selling their property quickly will need to be sure that the home is priced correctly. Overpriced homes sell much more slowly, if they sell at all. Condition also affects the speed at which a home will sell. Homes that are cleaner, more up to date, and in better condition will sell faster than others.